Keep your panels running efficiently. Solar Panels are fast becoming the norm on houses. Due to the great benefits of reduced electricity bills and even government subsidies its a no brainer to have solar panels for most people. But the panels are self cleaning? In our experience Self cleaning glass does stay cleaner than normal glass, but still gets dirty and needs a proper clean. A good way to illustrate why rainwater will not clean solar panels is by looking at your car windscreen. If you didn’t clean your windscreen for a few months, how much visibility would you lose? If left, the grime on your windscreen would accumulate and eventually ‘green’ over. Even if the car is rained on, the rain contains airborne dust particles that settle and attach to the surface after the rainwater evaporates. When we use our windscreen wipers, we clean the centre of the screen, but where the wipers do not reach, there is a film of dirt. The whole of your solar panel is in exactly the same condition as the edge of your car windscreen because they are both exposed to the same elements. Visibility through your windscreen is lost due to the loss of light. 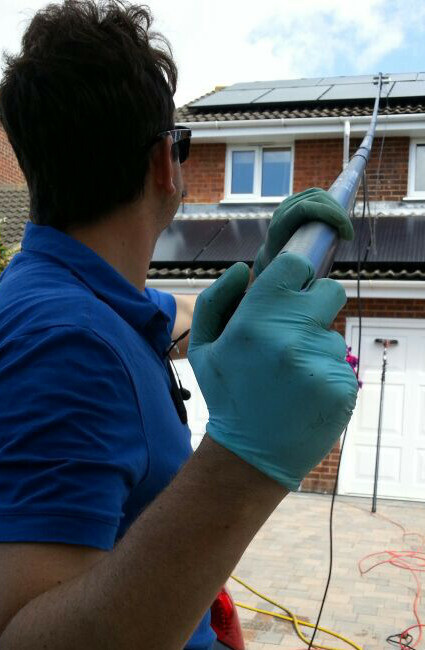 Therefore, the same principles hold true for solar panel cleaning. It is very important to maximise the light getting into the solar panel and in turn, increase your financial reward. We clean using the same technology we clean windows with, meaning you can be sure that your expensive panels or roof will not be damaged. We can clean up to 60ft high all from the ground meaning there isn’t much we cant clean. It is not recommended by solar panel manufacturers to use chemicals to clean your panels. Tap water and rain water will not clean solar panels sufficiently to keep them running at maximum efficiency. Using detergents to clean solar panels leaves a sticky microscopic film on the solar panel which actually attracts dirt and grime. Again, this will lead to your solar panels not running efficiently. It makes sense to have a regular clean to earn the most money out of your solar panels.